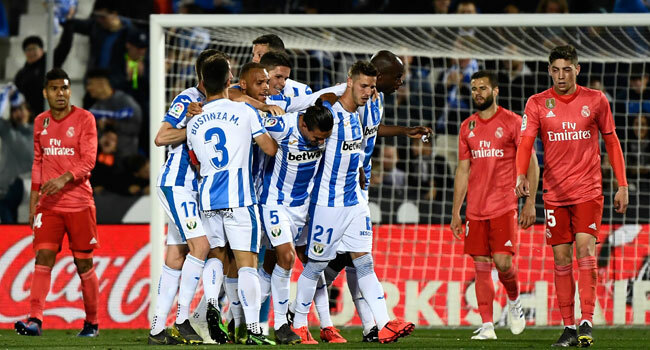 Leganes’ Argentinian defender Jonathan Silva (C) celebrates with teammates after scoring during the Spanish league football match between Club Deportivo Leganes SAD and Real Madrid CF at the Estadio Municipal Butarque in Leganes on April 15, 2019. Madrid delivered another thoroughly underwhelming performance at Butarque to remain 13 points adrift of Barcelona, with Zinedine Zidane’s second reign as a coach now delivering three wins, one defeat and a draw. Instead, they sit four points behind Atletico Madrid and finishing second, and above their city rivals, appear unlikely. Leganes climbs to 11th. Leganes, though, were otherwise rarely made to feel uncomfortable and shortly before half-time, they took the lead. Madrid failed to clear, instead of allowing Martin Braithwaite to roll back to Silva, who guided the ball into the corner. Casemiro threaded a neat ball through to Luka Modric, who twisted and set free Benzema. His first shot was pushed out by Pichu Cuellar but only back to Benzema, who fired in the rebound.